Throughout history, society’s access to privacy has been controlled by powerful central parties. Governments, religious entities, and dominant internet platforms have poured countless resources into maintaining this arrangement for the purposes of furthering their power. Today, we have become exceedingly numb to the startling consequences as increasingly powerful tech companies called GAFA — Google, Amazon, Facebook, and Apple — monetize our data without our knowledge or with half-baked consent. For evidence, we need not look any further than the Equifax hack of 2017 in which 148M social security numbers were leaked. We could also reference the Cambridge Analytica scandal in which Facebook accidentally, yet irresponsibly, exposed 87M user profiles that were used to sway voters in the 2016 U.S. presidential election. Despite countless examples that echo the same story, the onslaught of accelerating privacy erosion has lulled us into a sleepy, jaded state. We have been sufficiently hypnotized to believe that there is no possible other way in which the world should work. We shall assert that privacy does indeed matter and that decentralized cryptonetworks are the mechanism by which optimal privacy will be realized. To understand why privacy is of paramount societal importance, let us consider that it is a primary determinant of trust in human interaction. Trust can be conceptualized as the most salient underlying mechanism powering the formation, growth, and regulation of human networks. Trusting others implies that we do not have perfect information about each other. Privacy is directly responsible for this beneficial knowledge gap. If humans knew everything about one another, we would probably be a strictly transactional species, like bees or ants, not the highly emotional, interactive, and creative individuals that we are today. 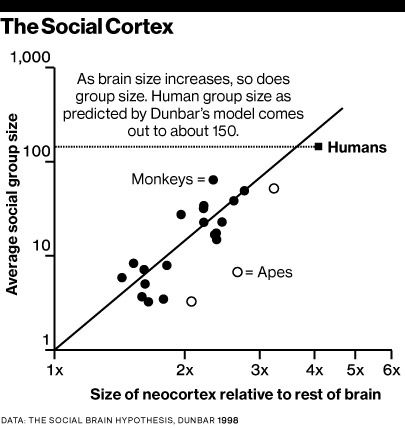 In fact, we can credit trust with helping human networks organize in droves magnitudes larger than is otherwise predicted by Dunbar’s Number. Human networks larger than 150 are typically bound by intersubjective trust in hierarchical rules, norms, or imagined orders like religion or nation states (see Sapiens). For other animals, the coordination game involved is far too difficult to play. Trust between humans should ideally be a non-zero sum game in which each party benefits. Notwithstanding all of the historical good that we can attribute to the principle of trust, it is also afflicted with inherent weakness. Unfortunately, trust is quite simple to cheat for one’s advantage because it is based on a power structure of voluntary submission. Coupled with the notion that trust is highly reflexive, any imbalance which emerges in a trust-dependent relationship can be quite difficult to reverse. This is the exact predicament we now find ourselves in with entrenched technology companies. Given the inextricable link between privacy and trust, it is helpful to track the historical shift in one’s ability to gain this right. From this thought exercise, we can begin to understand the corresponding implications for human networks in a decentralized future world. We begin over two millennia ago in Ancient Greece and end by exploring how cryptonetworks can usher in a golden age of individual and collective privacy, which may promote unbridled levels of innovation throughout society. Although Ancient Greeks were likely not the first to value privacy, they provide among the first pieces of tangible evidence that it was a societal concern. In Ancient Greece and thereafter, access to privacy was largely a function of one’s status and wealth. We can examine how elites built their homes for proof. As Ferenstein notes, elites constructed especially long corridors which prevented passersby from peering inside. Evidence suggests that many also employed doorkeepers to regulate who entered their residences. Elites did not desire prying eyes. Even famed Greek and Roman philosophers (i.e. Aristotle, Seneca, Marcus Aurelius) obtained their mandate to privately ponder radical new ideas not because of the inherent value of their thought. They hailed from wealthy and powerful families or moonlighted as authoritative figures within their respective Empires. For example, because Aurelius was Roman Emperor he could safely and privately ruminate on how to live life, and then capture these thoughts in his text Meditations. In contrast, other Emperors outlawed anonymous authorship and burned books they deemed distasteful. Throughout this period, there of course were novel innovations, such as in mathematics, cartography, and civil engineering, but only for the purposes of further entrenching powerful elites. In fact, average world GDP per capita was ostensibly lower in 1000 AD than in 1 AD. Total GDP growth over the same period was only about 2x, a pace that would soon be dwarfed in the next era of privacy. Therefore, we believe that top-down permissioned privacy which facilitates permissioned technological innovation is not an optimal model for scaling human networks. An epochal shift in privacy began with the innovation of Gutenberg’s printing press in 1440 AD. As books spread like wildfire, access to information became increasingly decentralized and reading rates spiked. The age-old practice of reading out loud was disrupted by this new, strange concept called silent reading. Literacy opened up radical new avenues of identity formation that occurred in the private sphere. Privacy also became a function of one’s education as church and state’s ability to regulate individuals eroded. As privacy for thought and ideas became increasingly valued by humans, we saw the rise of seminal movements such as Scholasticism, the Scientific Revolution, and the Industrial Revolution. We also saw an increasing appreciation for human rights. From these, the world was gifted some of its most important innovations that fueled a massive rise in life expectancy and GDP per capita. Total global GDP growth during this period (~1400–1900 AD) was about 20x. The modern privacy stack continued to develop over the hundreds of years post-Gutenberg. The 1st and 3rd-5th Amendments to the U.S. Constitution in 1791 codified fundamental principles of individual privacy.¹ Louis Brandeis and Samuel Warren’s famous 1890 piece on one’s right to privacy argued that the individual should have the right to “be left alone”. This legal opinion was in large part influenced by the emergence of innovative and exciting technologies that promised to improve the world at the expense of personal privacy. The earliest cameras, telegraphs, and telephones unlocked novel communication channels that enabled humans to interact on unprecedented levels but demanded costly trade-offs. As such, we can also characterize privacy beginning around the 20th century as a function of convenience. For evidence, we can point to the example of primitive telephone service, known colloquially as party lines. Party lines were local loop, shared-service telephone lines. Entire communities typically installed a single party line, calls on which anyone in the neighborhood could listen. Even the recognition of this grand trade-off of privacy for convenience did not prevent people from diving head first into telephone chatter. 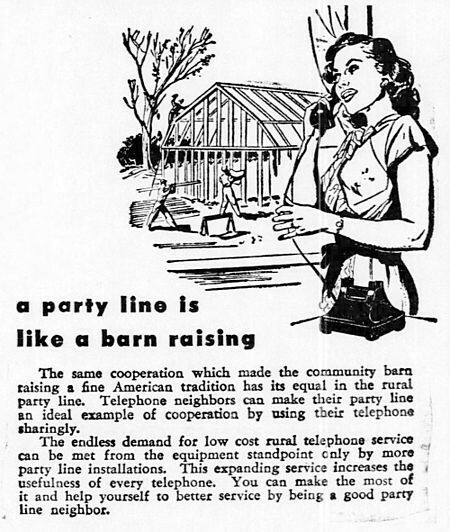 By the mid-1950s, a majority of Bell System subscribers in the U.S. and Canada utilized party lines. What’s different about Web 2.0? Into the 21st century, humans have been forced to trade more privacy for convenience as incumbent technology companies, primarily GAFA, increased their control over the rules and distribution channels of Web 2.0. To participate in the interconnected world, we are forced to sacrifice our data and identities. Even app developers with the best intentions of preserving user privacy cannot shake free of GAFA’s grip, because they are subject to opaque Terms of Service and other rules that prevent defecting from the status quo. As GAFA has increasingly centralized and become more powerful, the costs of trading privacy for convenience have become increasingly borne by society. If Facebook compromises user data, it does not face repercussions because switching costs are incredibly high. Hirsch calls this a ‘tragedy of the trust commons’ as GAFA externalizes privacy costs to its users and society at large. As we’ve all personally experienced, this problem is only getting worse. Thankfully, decentralized cryptonetworks can preserve personal privacy without the need to trust any central party. We cannot understate the effects of moving from a model of “trust in 3rd parties” to “trust in code”. In a crypto-driven world, privacy no longer becomes a function of wealth, status, education, or convenience. Privacy can now be encoded mathematically into a cryptonetwork’s base layer for all to access. However, it is important to highlight the different degrees of privacy within crypto. Although Bitcoin abstracts away the need for trusted 3rd parties, we now know that identity on its network is not anonymous by any stretch of the imagination (companies like Chainalysis have built multimillion dollar businesses based on deanonymizing Bitcoin transactions). Nevertheless, recent waves of crypto innovation have produced deeply intriguing privacy-preserving technologies, such as ZK-SNARKS/STARKS and ring signatures/RingCT. For the first time, the possibility of mathematically-enforced, complete anonymity can be guaranteed within the confines of a decentralized network devoid of intermediaries. As we look forward, additional cutting-edge, privacy-preserving crypto technologies will enable humans to organize in extremely complex networks at scales we frankly probably cannot imagine today. For example, NuCypher protocol for Key Management/Data Access Control, which is based on threshold split-key proxy re-encryption (PRE), can facilitate robust end-to-end encrypted applications. Using NuCypher PRE, medical patients could wield complete privacy over their medical data and decide which doctors and for how long they have access. Secure multi-party computation (sMPC) is another promising technology that splits computation amongst distributed nodes, although efforts to date have run into network overhead issues. And perhaps one day, the holy grail of fully homomorphic encryption (FHE) may allow for arbitrary computations on encrypted data at scale. NuCypher is actively pushing the boundaries of FHE research and executed the first FHE smart contract at ETHBerlin 2018. The implications are staggering. We can envision a world where scientists may utilize billions of encrypted medical records to train AI models to formulate new drugs curing terrible diseases. Privacy-preserving marketplaces may help regulate frictionless coordination of both humans and millions of AI-enabled IoT devices. New pathways for ideas and data to disseminate across networks will emerge, promoting innovation. The possibilities are endless. A future of guaranteed personal privacy protection is a better world than the one which we inhabit today. Yes, as a society, we will have to decide the degree to which we preserve privacy for individualist or collectivist goals (i.e. stopping malicious actors who take advantage of privacy to harm others). Coming to consensus will not be easy, considering that every application unlocked by privacy-enabling technologies is currently impossible to conceive. But, of one thing we can be certain. We should be able to choose how to exercise our right to privacy rather than leave that choice in the hands of centralized technology companies. Privacy-preserving crypto will help by strengthening the trust that is so fundamental to the vitality of any network. Objective trust in code will engender intersubjective trust between humans. And from this privacy-enabled trust will hopefully come a golden era of innovation that changes the course of humanity. We have much to be excited about. Of course, and unfortunately, the U.S. has often selectively enforced its codified law throughout history.